We are inviting you to our performance, the outcome of our explorations of the worlds of FUŠ*! Relax and pfusch yourself over the limit, and come along! The project is initiated by Nataša Mackuljak and Ivana Marjanović in the framework of Ivana Marjanović’s fellowship by kültüřgemma! 2013 (www.kueltuergemma.at) and diverCITYLAB scholarship (www.divercitylab.at). Additional support: ÖH and Bundeskanzleramt Österreich. 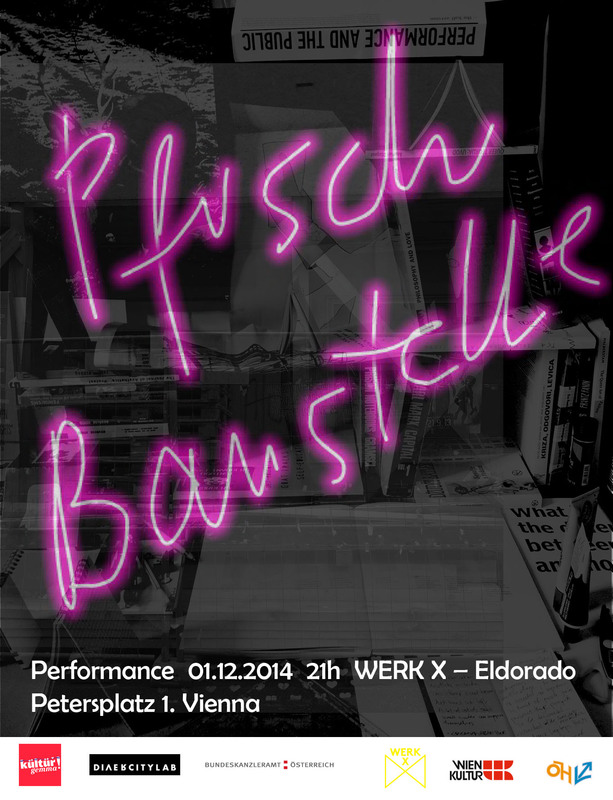 Pfusch Baustelle is a performance project related to our own (individual and collective) FUŠ stories and experiences. In April an open call for participants was released. Without audition or selection, all interested persons joined it, forming a group of authors coming from different art disciplines and backgrounds. The process of creative research on the concept and practices of “pfusch” led to thecollectively and horizontally produced theatrical performance. * Pfusch in German language means careless and slovenly performed work or illegalized work. In Serbo-Croatian language it means badly done work or product, bad copy of an original, lacking quality. Fušer (Pfuscher), besides those negative connotations means as well „majstor _ka kvariša“ which in English would be in a literal translation artisan who breaks things, makes them not working (in German wortwörtlich: Meister_in Kaputtmacher_in) but does that out of desire to repair or invent.